A more pleasant riding experience. 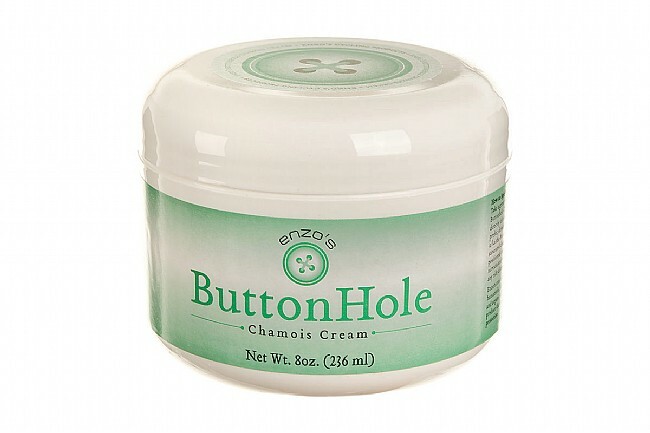 Enzo's Buttonhole Chamois Cream features a smoothing peppermint and menthol enhanced formula to eliminate friction, inflammation and other unpleasant sensations. Additional premium ingredients like Melaleuca oil, Hamamelis, the Wu-Chu-Yu herb and Organic Silicone compounds deliver the ultimate protection without the chemicals. 8oz jar. 100% Vegan. I use this chamois cream before every ride and it has totally alleviated any type of saddle sores I used to get. I'm sure the guys behind me also appreciate the peppermint fragrance too! Excellent tingling sensations. I won't use any other chamois cream. It smells so good - I have to remember not to eat it. I will get more. I wish it came in single-use packets or a squeeze tube for traveling to events. There are several similar chamois cremes that I have found work well. Enzo's is pleasant to use and I find the jar is far more convenient than squeeze tubes. Enzo's is often priced a little more competitively than some other brands. I enjoy using this chamois creme during the heat of the summer. When compared to other products I've used, I find it helps me stay cooler and drier in the seat area during rides lasting more than 2 hours, providing a welcome relief to the area around the perineum and seat area. Aside from providing a comfortable ride the end result is less, sweating, chafing and bacterial infection that can lead to painful saddle sores (trust me I know about saddle sores). To help prevent the chamois from absorbing all the creme during a long ride I find it helpful to treat the pad with a drier stick product before adding a thin coating of the creme. I also find it holds its smooth consistency over time where other products can become sticky. While there may never be a product that is 100% safe I prefer their natural ingredients over a petroleum based product and the cooling menthol really does work. This has been my go to summer creme for the last 3 summers. The tub makes application simple to the end. On sale it's an unbeatable value. I had switched over from Assos. The quality of this creme is similar in performance and the formula is based on proven herbal remedies. I've used a wide variety of chamois creams in my 25 years of cycling and Enzo's ButtonHole is by far my favorite. Works great, smells great, just that little bit of menthol to add to the warmtingle factor... and is a reasonable value unlike some of the other products on the market. Highly recommend this stuff! I normally use Pace chamois cream and I prefer the Enzos Buttonhole cream for its easier application and great feel down where it counts. Have had no issues with irritation or sores while using it. An excellent product, if a bit expensive! Great smell not too greasy. Not too much of a warming effect if that's what you are looking for. So far so good. Very refreshing with the menthol! I have used on a couple of 55 mile training rides and it's worked flawlessly. Nothing but the best for my buttonhole. Great stuff. Like Assos but with a little more 'freshness'. Makes you nether region smell like cookies. Never a bad thing. I sweat lots and conquer long rides. This stuff is my top choice! Best chamois cream I have ever used ! I don't really like using chamois cream because as I am applying it the stuff tries to go everywhere or feels weird. Buttonhole cream stays on better and has a pleasant smell which doesn't hurt. If you are prone to post ride irritation I would strongly advise you to try this product. Button Hole is another excellent chamois cream. Comparable to other quality creams on the market as it works well and does what it is intended for. I would have given it 5 stars, but the peppermint scent is too intense for me. Good product but very strong smelling. Seems to lubricate well, better than some other products I've used. Strong menthol and peppermint smell makes me wonder about attracting bears where I ride in the Tetons. I'll just have to go faster. Okay, it smells like peppermint breath freshner and who out there prefers tic tacs over fine chocolate? But it's half the price and you get twice as much! And when you live in the not idyllic weather of a flyover state, many hours of training are to be had indoors.